You invested in a hot tub so you can enjoy spa sessions anytime you want at the comfort and privacy of your home. With it sitting out in the open though, there are all kinds of things that can hinder your ability to fully enjoy it: prying eyes, bad weather, and insects. The best hot tub gazebo will enable you to better enjoy your spa all-year round, come rain or snow while adding style to your backyard and protecting your hot tub as well. 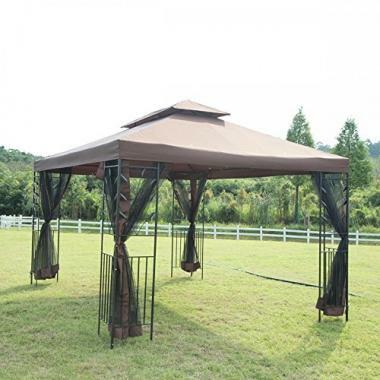 Gazebos are popular spa enclosures and there is a wide variety of options. Here, we make it easy to find the best hot tub enclosure or shade for your home spa so you can get soaking whenever. We’ve reviewed ten great spa gazebos and also have a guide to help you make a wise pick. Let’s start with our top picks. Are mosquitoes or other bugs the buzzkill whenever you want to enjoy a relaxing soak at dusk or at night? Then this gazebo is the best hot tub enclosure for you. The mosquito netting it comes with will confine the bugs to the outside so you can relax and enjoy your pampering sessions in peace. The polyester canopy keeps out the sun and light rain. Installing this gazebo over hot tub is easy as it comes with clear instructions. It requires two people to put it up. Once up, you will appreciate how beautiful it looks in your yard. It's pretty sturdy too. With the powder-coated steel frames, double canopy top with double venting, and octagonal design with eight posts, it holds up well to strong winds and rain storms and screens billowing isn't a problem. 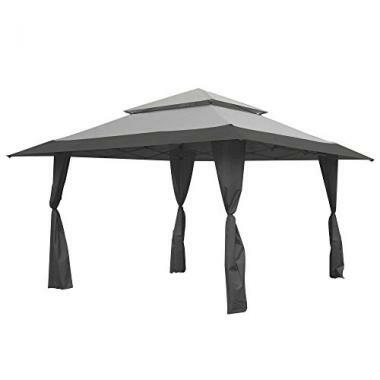 If you need a gazebo you can put up over your hot tub whenever you need protection from the scorching sun or a rain shower, this elegant canopy by Kinbor is it. 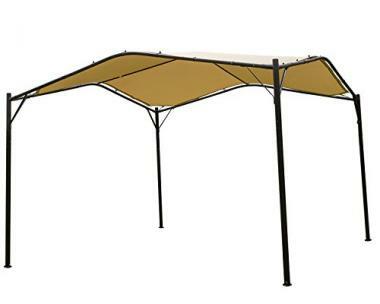 The polyester canopy provides tons of shade and shelter. Easy to put up, take down and easily portable, you can also use it at picnics, as a beach tent, and wherever you need temporary shelter. With the hexagonal design and powder-coated steel framework, it is pretty sturdy and stable but not enough to be a permanent shade. The beauty of this gazebo by Z-Shade is not just in its attractive looks that will enhance your outdoor space. It is also in its instant pop up canopy functionality. 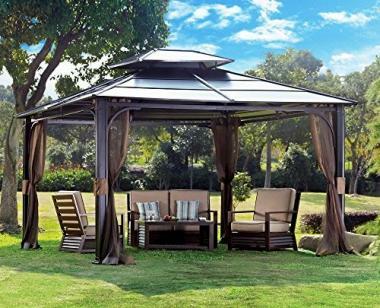 It comes with fully assembled frame sets so it is a shelter you can put up easily in minutes whenever you're in the mood for a spa session but the sun or rain is in the way. The 150 denier polyester fabric is pretty shady and offers 99% UV protection. The frames are powder coated steel and it comes with stakes for stability. To ensure it shelters you for a long time, be sure to take it down when it is snowing or stormy. Interested in a permanent hot tub shelter? The Kozyard Alexander permanent gazebo should be in your list. The roof offers excellent shelter from the sun's rays and rain. The double layer privacy curtains protect you from prying eyes while the PBV-coated mosquito netting keeps bugs out. It also shelters your hot tub from degradation by the sun's rays. It is built for year-round use and can withstand all kinds of conditions. The aluminum frame is rustproof. It also comes with an anchoring stand for sturdy installation. The galvanized steel roof is secured by a five years warranty. This structure can withstand a snow load capacity of 2500 pounds and has a wind rating of 40 miles per hour. Its installation is a 2-3 people job and takes about 6 hours. It adds an element of sophistication to your outdoor space and complements many styles of outdoor furniture. The cupola at the roof offers ventilation. The Kozyard Alexander is a top rated hot tub enclosure and you can expect to get many, many years of enjoyment out of your investment. This unique swan-shaped gazebo by Mefo Garden makes a fancy hot tub shelter. With it over your home spa, you can enjoy relaxing soaks without the sun beaming or the rain pouring on you. The canopy is a strong 250g/m2 polyester fabric. It's water resistant, fade resistant and provides great shade and UV protection. The structure is very sturdy and you can anchor it to the ground for more stability. 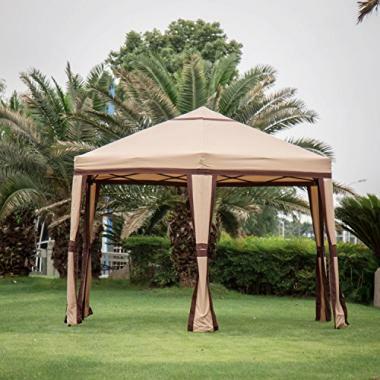 The gazebo frame is heavy-duty enough to remain standing in the face of tough conditions as it has thick metal poles and supports on each corner. You can leave it outside without worrying about its ability to hold up. To extend its lifespan, you can take it down in winter. 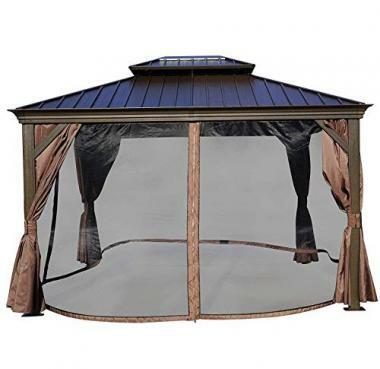 If privacy is your main reason for enclosing your hot tub, this elegant fully enclosed hot tub gazebo by Barton is the best hot tub gazebo for you. It features privacy panels and mesh curtains that zip closed or tie back giving you an intimate getaway you can enjoy just the way you want without feeling self-conscious. It is also equipped with a mosquito screen. The canopy material is high-quality and water resistant so it is able to provide shade against rain and sun. The frame is designed to withstand windy conditions. Installation is reasonably easy and takes two to four people. If you live in a windy area, you need a heavy-duty and sturdy spa gazebo with a hard roof like this Sunjoy Chatham. Its hot tub gazebo reviews attest that it withstands strong winds and heavy snow. Installing this good looking gazebo over hot tub creates an inviting and luxurious retreat in your backyard. 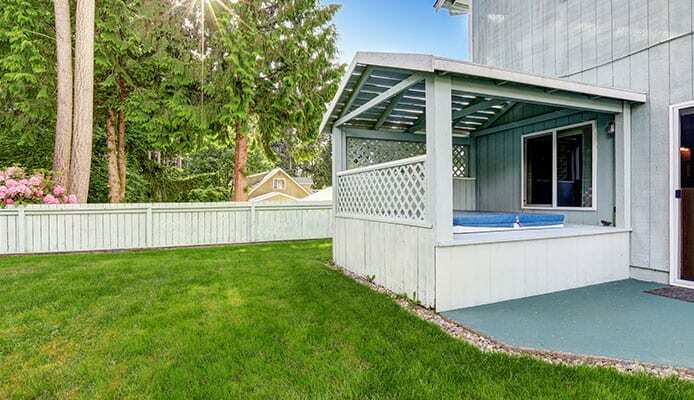 Beneath its shade, you can enjoy baths come rain or shine. With the bug screens, you will be able to enjoy your hot tub at night without insects bugging you. If its privacy you want, you can also install your own privacy curtains. With metal steel roof and powder coated steel and aluminum construction, this structure is a long-term investment. Interested in a permanent structure but find paying a builder to construct a hot tub shed prohibitively expensive? 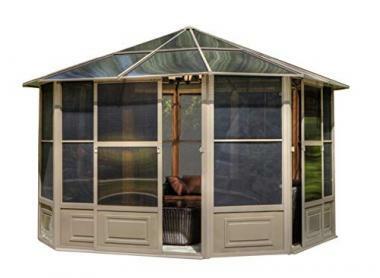 The Gazebo Penguin 41212 Solarium is a great less expensive and low maintenance alternative. 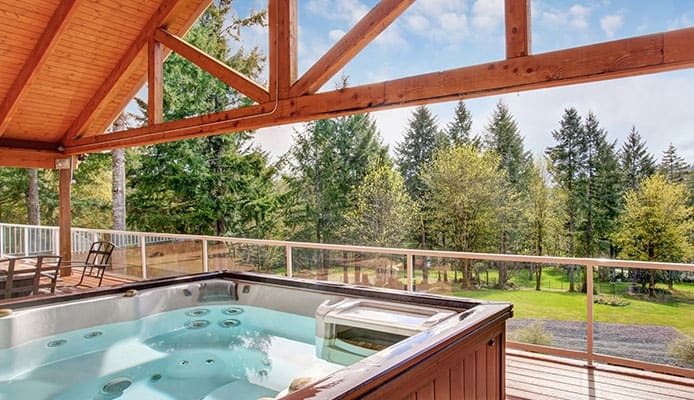 Installed over your hot tub, it will create a wonderful retreat you can enjoy anytime you want without having to worry about UV rays, rain, snow, bugs, or being watched. It even has hooks for hanging lights to create a relaxing ambiance. Constructed using powder-coated aluminum structure, rustproof baked enamel finish, and UV-treated reinforced roof, 5-position wind panels and fiberglass screen this solarium is built for all-season use. It fares very well in heavy snow and gusty winds. It takes three people one to two days to put it up but it is well worth the effort and money. It will even protect your hot tub from the elements. 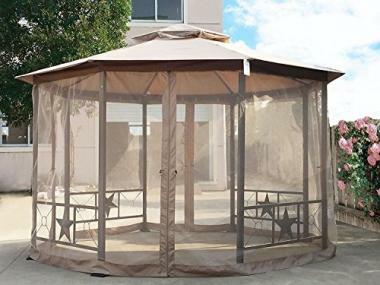 This gazebo offers sun shade, rain, and bugs protection. The canopy fabric is a UV and water resistance 180g polyester. It features a four-sided mosquito netting that you will appreciate if you live in a bug infested area and want to enjoy spa sessions at night. To ensure it is sturdy, the frames are steel. The double tier top is not only a style feature but also allows wind to pass through instead of blowing away the canopy. It also comes with stakes to ensure it is stable on the ground. 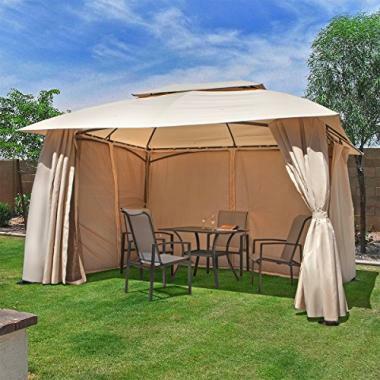 This gazebo by BestMassage makes for a beautiful addition to any backyard. Its 180g polyester canopy also offers great sun shade. It is fully enclosed by a mosquito netting with zippers to keep insects out. Quality and sturdiness are surprisingly good for the price. The powder coated steel framework and vented top offer it stability in windy conditions. Bolt it down very well and you can get several years of enjoyment out of it. The best hot tub gazebo for you will come down to what you want it for. You will definitely want shade but it may be that bugs are your biggest problem and you want one equipped with mosquito nets. Below are a few more things to take into account in the selection process. First of all, consider how a gazebo is going to go up over your jacuzzi. Can you install it yourself with the help of one or two people or do you have to bring in a professional? You can tell how easy a gazebo is going to be to install by going through its hot tub gazebo reviews by owners. The top rated hot tub enclosures have a simple to assemble design and come with hot tub gazebo kits that include the essential parts including tent stakes and clear installation directions. A hard metal roofing is the ultimate in durability. A fabric canopy should be heavy-duty, fade resistant and well-ventilated to ensure it isn’t blown away by the wind. The framework should be sturdy and made from a strong and highly resistant metal such as powder coated steel. Correct installation ensures that a gazebo actually lasts for as long as it can. If your gazebo isn’t heavy duty, taking it down when it is snowing and windy can prolong its lifespan. 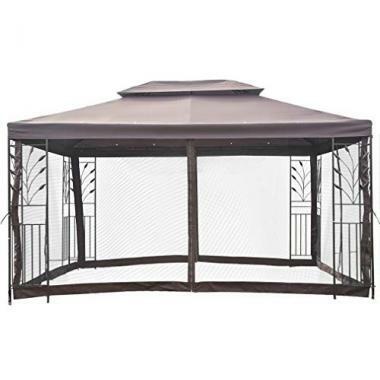 Sturdier gazebos are composed of strong steel frames. The canopy should be strong, well attached and well-ventilated to prevent wind from blowing it away. Proper installation also contributes to sturdiness. If you live in an area that experiences gusty winds, consider anchoring your gazebo to a concrete slab or wooden deck or adding weights for more stability. A hot tub gazebo must be well ventilated to provide a way out for the heat and steam and prevent mold, mildew, and rust. Ventilation also contributes to a gazebo’s stability, as it allows wind to pass through instead of blow away the gazebo’s canopy. A gazebo also adds style to your outdoor space. Before you order your gazebo of choice, imagine how it will look set up in your backyard and select one that will add to its aesthetics. The key design feature to pay attention to here is the rooftop tent design. Q: What Are The Benefits For Using A Hot Tub Gazebo? A: You might have only a roof over your hot tub, which will provide shade against the sun and rain as you enjoy your spa. Or a fully enclosed hot tub shelter creating a retreat safe from all kinds of weather elements, nosy neighbors, and insects. 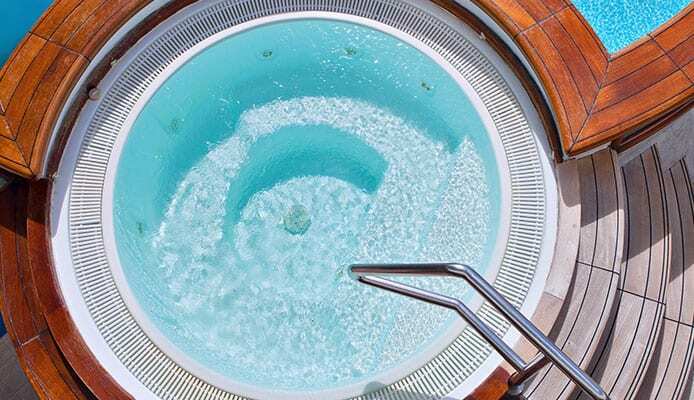 A hot tub gazebo will also protect your hot tub, the hot tub chemicals, and hot tub cover from weather elements, debris, and other contaminants thus ensuring that you get to enjoy your investment for longer. Q: Can I Install The Gazebo Or Do I Need A Professional To Do It For Me? A: This will depend on the type of gazebo you’re installing. You can install any of the best hot tub gazebos in our reviews with the help of one or two pairs of hands. If you’re having a permanent hot tub shed built, you will need a professional to do it for you. You can get much more enjoyment out of your home spa investment by shading or enclosing it. The good thing is: you don’t have to spend a small fortune to get a permanent structure installed. Gazebos create excellent retreats in backyards and a jacuzzi with gazebo is one of them. You just have to find the best hot tub gazebo for your needs and backyard. We hope our guide has made this easy. How about you? Which spa enclosure is your personal favorite, even if it isn’t included in our hot tub gazebo reviews? Let us know your thoughts and experiences in the comment box below!